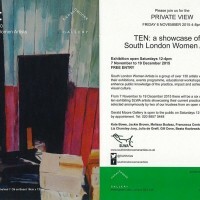 South London Women Artists is a group of over 130 artists who aim through their exhibitions, events programme, educational workshops and publications, to enhance public knowledge of the practice, impact and achievement of women in visual culture.From 7 November to 19 December 2015 there will be a six week exhibition with ten exhibiting SLWA artists showcasing their current practice. 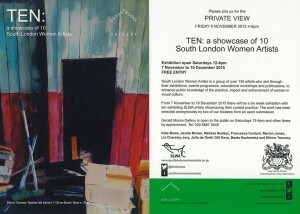 The work has been selected anonymously by two of our trustees from an open submission. Kate Bowe, Jackie Brown, Melissa Budasz, Francesca Centoni, Marion Jones, Liz Charsley-Jory, Julia de Greff, Gill Dove, Beata Kozlowska and Eithne Twomey. 2015, 60x 60 cm, framed.